The Caribbean is nothing but short of amazing distilleries. Because of this we’re always on the search of the latest and greatest craft liquors to bring to our readers. This month we stumbled upon the beautiful Virgin Island Craft Distillers, located in St Thomas. Co-founded by two brothers, the company is a true family affair. John Brugos was initially invited to the island to work as a chef, and shortly after invited his entrepreneur brother, Joe, to join him. The pair has lived on the island for some years now and continue to produce unique local spirits at their distillery. Even the devastation of 2017’s Hurricane Irma couldn’t stop them from distilling, they were back up and running only 126 days after the category 5 storm hit St Thomas. And don’t worry – they made sure the rum barrels were safe from harm! VI Craft Distiller’s dark rum is inspired by Sir Francis Drake’s adventurous spirit. As he was born a peasant, and later knighted by the Queen, this rum is crafted to appeal to a wide range of palates, from pirates to royalty! This warm smoky rum, is perfect for the holidays with hints of spices, citrus, and caramel. The distillers recommend trying this in a classic Dark and Stormy or their signature Lead Coffin cocktail. Blue Marlin Vodka boasts a fresh flavor “as memorable as your biggest catch.” Inspired by deep sea fishing, and the thrill of catching a fisherman’s most sought after prize, the Blue Marlin vodka is said to similarly satisfy any Vodka connoisseur’s thirst. It’s smooth, fresh flavor profile, reminiscent of the Caribbean breeze, pairs perfectly in a passion fruit cocktail. 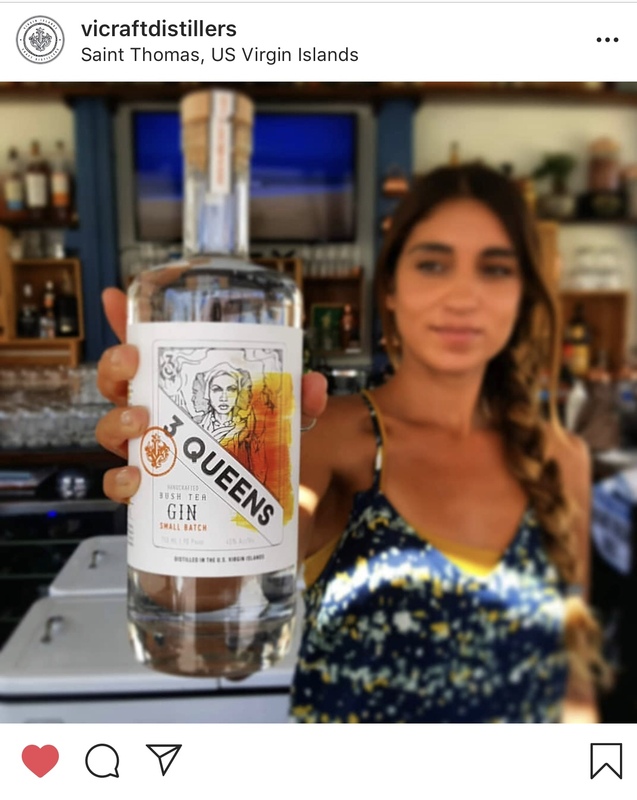 3 Queen Gin was inspired by Mary, Agnes, and Mathilda, leaders of the 1878 labor revolt, also remembered as the Fireburn in St. Croix. This small batch spirit was crafted as a way to continue to toast to the three queens’ legacy, and to encourage others to stand up for what they believe in. The juniper based gin has hints of vanilla, fennel, and anise, the perfect flavors for tropical holiday sipping. Try it in Queen Mary’s Lemonade! For now, these spirits are for sale in stores and restaurants in Jost Van Dyke, BVI; St. John, VI; and St. Thomas, VI. Which makes for an awesome excuse for a weekend getaway to the Virgin Islands! As they are a small distillery, tours are conducted by appointment only – book your private tasting by emailing info@vicraftdistillers.com or by calling 855.440.3362. Follow VI Craft Distillers on Instagram at @vicraftdistillers to stay in the loop on their next craft batches!